Foroch is a Bosmer publican and the proprietor of Gottshaw Inn, a remote inn found along the Gold Road between Kvatch and Anvil. He offers food and shelter for the night and is a basic trainer in Mercantile. Although a drunken Imperial Legion Soldier is his only regular, Foroch still takes his innkeeper duties very seriously: he can be found behind the counter at all times, except when sleeping on his mat between midnight and 4am. He will rent you a bed 24 hours a day, but will only offer training and food when awake. 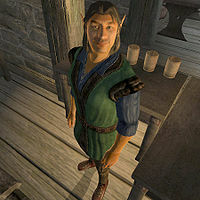 The empty inn seemingly hasn’t provided much wealth for Foroch, as he wears a simple set of regular middle-class clothing: a blue & green outfit and a pair of quilted shoes. He also carries four or six gold coins. When you approach him about a room, he will say: "Aye, there's a bed free if you need it. It'll be 10 gold for the night. What do you say?" If you agree to the deal, he will point you in the right direction: "Right then. Up the stairs in the back, and it's the last door at the end of the hall, straight ahead of you after turning that corner." If you talk to him about it again, he will remind you that "The room at the end of the hall upstairs is yours for the night, just like we agreed." Esta página foi modificada pela última vez à(s) 01h21min de 29 de maio de 2012.